Not much can be said about the past weekend. It's disappointing, and a was a bit reminiscent of last weekend against South Carolina. For the masochists out there here are the recaps. GOOD NEWS- The Tigers are still in the upper half of the SEC. That gap between the top 8 teams (which Auburn needs to be a part of) is growing wider and wider with Mississippi State, UGA, UT, and UK all pulling up the rear. Even better? Auburn has already played UGA and gets UK, UT, and MSU all at home. THE BAD NEWS: It's going to be a rough stretch for the Tigers over the next two weeks. I keep an eye out on our schedule and it's that stretch of games between 4/16 and 5/18 that gives me hope for Hoover. UK, UT, MSU all bottom feeders in the SEC (so far) and all at home. Midweek games against Samford, Jacksonville State, and New Orleans (plus a revenge game against Troy). The toughest roadbump will be a series in Fayetteville but I don't know what to make of the Razorbacks this year (my dark horse to win the league) after their tilt against UK. It was downright bizarre to say the least with the Wildcats exploding for run totals of 12 on Friday and 16 on Sunday. If not for a Walk Off Grand Slam by Arkansas on Sunday the Cats would have stolen that series. Another oddity this past weekend was UT. The Vols managed to win 2 straight games and their first SEC series against an Ole Miss squad with high expectations. Honestly, after the LSU series, everything that remains (from what I've seen) are very winnable games. Factor in a healthy Tiger team for the first time all year and the possibility to just start steam rolling and I start to salivate just a little bit. Until then? Well it will be rough. In fact, it wouldn't surprise me to see Auburn hit a terrible skid and drop their next 5 games. Then things will really start to look grim. That's what makes the Vanderbilt series so crucial. Vandy is a team just like Auburn in the SEC. Not great, not bad, just in the middle. If the TIgers are going to end up in a cluster in the middle of the pack, then Auburn needs to win series against other mid-pack teams. If Auburn can pick up a series win here, then I think it would ignite the Tigers down the stretch. A nice roll and we can put all doubts of Hoover away and start thinking about Regionals. More than that, it would stop "the slide" which has plagued Auburn in the past few years (including last season when the AU dropped 13 out of 15 SEC games. – On the overrated side, I think you have to wonder about Ole Miss. Taking the series from Florida is fairly impressive, but it only came by a run and putting up a combined -2 against the likes of Kentucky and Tennessee–two teams that have gotten flattened whenever they haven’t been playing Ole Miss–is a red flag. That's from Jerry and The War Eagle Reader. An excellent write up that should give Tiger fans hope for the coming weeks. Jerry makes a great point about Ole Miss, something is rotten in Oxford. For starters, they can't seem to win on Sundays (a problem Auburn definitely doesn't have). How bad are those Sunday woes? 5 straight losses where the Rebs have given up 11 runs a game on average. They've tried 3 different starting pitchers, with none seeming to stick. THE GOOD NEWS: This is probably the best time for it to happen. Ok, the Alabama series was a wild one. It all started on Friday when Hunter Morris was plunked by an errant changeup. Whether or not that was intentional doesn't matter. What does is the Hunter's reaction, the tense atmosphere in the park, and some weird SEC rules lead to ramifications for the next few games. With the Friday beanball, warnings were issued. Warnings that carry over for the duration of the series. When Alabama hit an Auburn player again on Saturday, the pitcher (who had JUST come in on relief) was tossed and so was Alabama coach Mitch Gaspard. Gaspard getting tossed lead to a suspension for Sunday's game. On Sunday, Grant Dayton had a ball slip. Dayton is tossed. Coach Pawlowski is tossed and now the suspensions set in. CJP won't be coaching Tonight's game. That's part of his one game suspension. Grant Dayton now has to be suspended 4 games. Thankfully, and rarely, Auburn has two midweek games to cushion that blow. Grant will miss Tuesday (GSU), Wednesday (USA), Friday (LSU), and Saturday (LSU). He'll be available Sunday so it really doesn't knock him out of his rotation. Rule 5.16.D of the NCAA's baseball rulebook states that, "If the coach has been warned during or before the contest, the coach also shall be ejected and suspended for the next regularly scheduled contest (one game)" if a pitcher intentionally hits a batter. But the absurdity of this situation is that the umpires were the only ones claiming either of the final two offending pitches was intentional. Of the coaches and the players involved, no one said they thought Head or Dayton acted on purpose. And those were the only two instances of a batter being hit in the series' final two contests. "It was a breaking ball that hit me," said the Tigers' Patterson, who had hit two home runs Saturday prior to facing Head. "I don't think it was intentional. I just think the umpires were trying to keep everything on an even keel, so no big deal." Dugas didn't claim intent by Dayton, either, saying that "I guess it just got away from him." Dayton held a 7-1 lead in the bottom of the eighth when he struck Dugas, who was 3-for-3 on the afternoon. Neither bench reacted, but Dayton immediately responded as if it was an accident. Yet home-plate umpire Tony Maners, mimicking crew-mate Scott Kennedy from Saturday, tossed Dayton (and Pawlowski) within seconds. "I knew that I was going to get thrown out," Dayton said. "But I just missed my spot. That really is all there is to say about it." Second, it puts CJP on thin ice. If he gets tossed again, then the suspensions increase. Everytime he gets thrown out, he will have to sit the next game. The only other thing that affects is tweaking the rotation. Cole Nelson is set on Saturday, but what about Friday. I know it was tossed around a bit about Dayton (who has been our most consistent SEC starter) moving to Friday. Well, that will have to wait another week. THE GOOD NEWS: Auburn gets midweek tuneups against Georgia State and South Alabama. THE BAD NEWS: Don't let the names fool you. Both of these teams are challenges. For Dexter, it will be his biggest test of the season and one that will truly show if he's ready for the SEC. THE BAD NEWS: It's not how Auburn should be winning games. Yes, the gaudy HR numbers are good. However, we saw that last season with the feast or famine approach that Auburn had last year. Hopefully, we haven't regressed to that point with high scores and high strikeout totals. Just this past weekend Auburn struck out 11, 9, and 10 times. Those 7 HRs accounted for 7 of AU's 17 runs this weekend. That's not a good number. Especially when you consider that each of those HRs was just a solo shot. Now, if we were able to couple our solid station to station baseball (and getting men on base) with homerun power then the O will be truly unstoppable. The UGA series is a prime example of that. THE BAD NEWS: Auburn's Fielding continues to be atrocious. THE GOOD NEWS: It has to get better. This is all just gut feelings, but the fielding will improve, just by default over the next few weeks. Just by the addition of Trent Mummey. When TM returns, he should take his spot into CF. That would push Creede Simpson to RF or out of the outfield completely. For the sake of argument let's say it moves Creede out of the OF altogether. It also bumps Tony Caldwell out of RF. 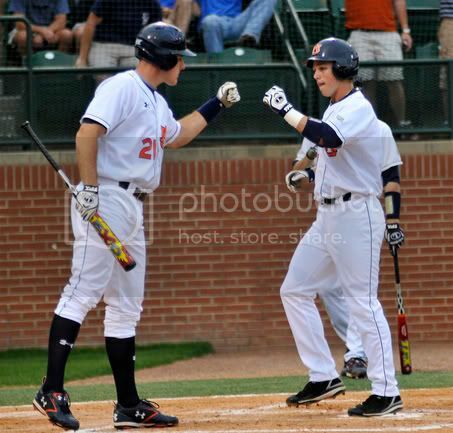 Those are 2 of Auburn's best batters that will be without a place. Creede could either move to 3B (where he has experience) or DH. TC could either go to DH or spell Ryan Jenkins at catcher. Either way, you've replaced to of the Tiger's most troubling positions fielding wise, with two players with the highest fielding position. How CJP changes his lineup when Mummey returns will be one of the most interesting things to watch in the coming weeks.